This entry was posted in Uncategorized and tagged Australian comics, Emmet O'Cuana, Frew Publications, Hopscotch Friday, Nat Karmichael, The Phantom by kevpat. Bookmark the permalink. 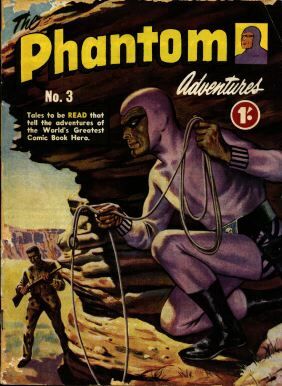 I have read phantom since 1950s. , his oath is Never can he be judge jury and executioner . The word “justice” means , like in the bible, an eye for and eye , so the phantom should destroy evil, putting evil people in jail , doesn’t destroy evil. It allows evil to fester . The Chinese do it right although they murder innocents as well. But when the phantom catches , in the act, he should deal to the bastards.